To implement a proactive approach to performance management and resolve performance bottlenecks before they affect the business, savvy organizations are turning to IBM InfoSphere OptimT solutions. 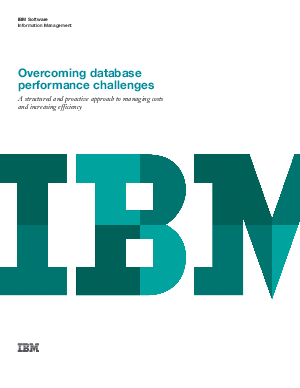 These solutions enable developers, DBAs and other IT administrators to address performance problems in IBM DB2® and in associated applications, including Java and IBM DB2 Call Level Interface (CLI) applications. The IBM solutions also offer out-of-the-box configurations for SAP, IBM WebSphere®, IBM Cognos®, IBM InfoSphere DataStage® and InfoSphere SQL Warehouse applications.